Malcolm Cooper, global tax and treasury director at National Grid, talks to Christian Doherty about overseas investment, virtual accounts and the company’s diversified portfolio. Recent years have seen National Grid venture overseas to invest in the US market, and in 2014, the company was named 'Sustainable Business of the Year', while it also owns and operates four of the eight regional gas distribution networks in the UK. Last year, UK operations generated cash on its operations of over £4.0 billion with assets of £34.7 billion. Meanwhile in the US, National Grid has networks largely centred in the north-east and New England regions, serving over 3.3 million customers with electrical power and 3.4 million customers with natural gas. The most recent figures reveal a capital investment of 2.4 billion in 2012-13, mostly focused on improving existing infrastructure and building new facilities. In addition to financing the work via existing revenues and cash reserves, Malcolm Cooper, global tax and treasury director at National Grid, has, for a long time, accessed funding from the European Investment Bank (EIB), most recently a £1.5-billion loan. It was the latest in a long line of EIB-sponsored financing and marks, Cooper says, a continuation of National Grid's long relationship with the bank. "We're exactly the sort of company that EIB was set up to fund," he explains. EIB's mission is simple: to lend centrally guaranteed funds to companies to invest in infrastructure. And only charging a small handling fee over the cost of borrowing gives National Grid a real advantage on the cost. "Given that it's got a AAA credit rating, guaranteed jointly by every country in Europe, that probably makes it one of the strongest counterparties in the world. For it to default, it would have to default itself and every European government would have to default individually as well, so the probability of that happening is small," adds Cooper. "The other big advantage is one of structure. If you take a bank loan - quite aside from the fact it would cost an awful lot more in interest - you'd struggle to get out more than three to five years; that kind of maturity," Cooper explains. "With EIB, you can go out 16-18 years; much longer dated but alongside that we have the option of drawing down the EIB money in index-linked form, which follows the form of an index-linked gilt whereby you pay a real interest rate on the debt but the value of the debt is accredited every year by RPI inflation." And that, Cooper says, represents a very attractive form of borrowing for National Grid because its assets are RPI linked, meaning the EIB structure provides an effective hedge to the business's RPI exposure from the underlying operating assets. "We'd struggle to get RPI-linked debt from a bank, and certainly wouldn't get it for 17 or 18 years, and you certainly wouldn't get it at the price the EIB would charge us," the treasurer notes. The investment from EIB illustrates National Grid's evolution into a properly funded, efficiently run organisation that stands as an example to some of its private sector counterparts. Central to achieving that success is the company's innovative use of technology, something Cooper says is fundamental to ensuring the business is adequately funded with the right levels of risk management embedded. However, he admits that despite vendors' encouragement for corporates to adopt the latest game-changing technology, a gap between aspirations and what is available still exists. "I think there's always an aspiration for better, more modern technology," he says. "In some ways, we've become spoilt; you look at a smartphone and you can then download the most amazing apps that some 17-year-old has written in their bedroom, and yet when you come and look at a financial system or a treasury system, it feels a bit clunky. And I wonder why aren't these keeping up with the technology I've got on my phone?" However, one new technology has proved popular in the NG treasury team: virtual accounts. "We do use that technology and it's very effective for us," Cooper says. Cooper's enthusiasm for virtual accounts is perhaps in part explained by the success that National Grid had with its adoption of SWIFT five years ago. "When somebody connects to our network, they typically give us a deposit to fund the investment that we're going to make on their behalf, and historically the way we managed that was we had an individual bank account for each deposit," Cooper says. "If we went down that route today, we'd probably have 250 bank accounts holding customer deposits." Instead, National Grid uses virtual-account technology where it keeps all of that money in a single account but it remains segregated between each individual deposit. Interest accrues on each individual deposit; payments are linked to each individual deposit so it's exactly the technology that people talk about with virtual accounts. Cooper reports that by adopting virtual accounts, the treasury function has managed to get rid of hundreds of bank accounts. "With virtual accounts, you can get a single report of your total position and it's simple," he says. "It might sound really basic but there is quite a big overhead having a bank account. You've got to reconcile it; you've got to keep all the bank statements; you've got to do a reconciliation for the auditors; and all the rest. So, if you can go from 250 accounts to one, then you reduce your admin overhead enormously." Cooper's enthusiasm for virtual accounts is perhaps in part explained by the success that National Grid had with its adoption of SWIFT five years ago. The company was an early adopter and Cooper recalls that the move towards linking into the global banking and payments systems went extraordinarily well from day one. "We've been using it in treasury for four or five years, and we've now got the business units using it as well. So we've actually got rid of all of the bank payment systems that we used to use and we now actually go directly via SWIFT, which gives us a direct interface from our treasury management system into SWIFT, so it works exceptionally well." But for Cooper, the next stage on from embedding Swift across the organisation is to get more from the system itself. "One of the things that banks seem to be reticent to pursue - and when I talk to corporates, they all seem very excited about it - are things like bank mandates," he suggests. "Most people would have a hard copy these days or email at best; actually, why not do it via SWIFT? You've got a very secure network there; why not do mandate letters via SWIFT?" Cooper believes this step would be a great development if it transpired. Alongside that, Cooper has high hopes for the possible application of 'diversified ledgers', the technology that underpins Bitcoin. Central to the idea is that users can process payment in the way Bitcoin does it payments are processed peer to peer via a secure network without going via an intermediary at all. "I think this is a few years off yet but certainly if you look at things like share dealing, the possibilities are endless. When you buy a share, you go via a clearing house. But if you could use a diversified-ledger technology that underpins Bitcoin, you could completely bypass clearing houses. So it looks like a really exciting piece of technology and could prove to be very disruptive." When he isn't gazing into his crystal ball, an increasing amount of Cooper's time is taken up by a number of projects outside of treasury. The most striking is his position at the head of National Grid's property portfolio, which currently holds a surplus of around 650 sites. Typically, old operational sites, for instance, gas works holders, most of these are now obsolete, leading Cooper to work on a programme to put them to better use. "We no longer need these sites, so I've got a team of people working together to clean them up - because they tend to be polluted - and remove any residual equipment," Cooper says. "My team knocked down 18 gas holders last year and we're selling the sites." One venture he's especially excited about is the joint venture National Grid has set up with Berkeley Homes, one of the UK's premier house builders, to bring National Grid sites to market. "We have around 300 acres within the M25 and actually we can make a big difference to the housing position in the south-east." Cooper points out that the severe pressure on housing stock in the south-east would make simply sitting on these sites a terrible waste of a precious resource. Having recently received its first planning permission, Cooper and the team are now working as hard to bring the sites to a position where construction can begin on some much-needed housing stock. And it's not just housing. "We see our mission as trying to add to the social infrastructure, so as part of that we're expecting to build a couple of schools and a few other facilities to bring these sites to market, and actually use what is currently an unused asset to brownfield land that has been unloved and unwanted for many years; working really hard to bring those to something of use to society," Cooper says. "So I'm spending probably a disproportionate amount of my time on that at the time because I'm really passionate about it and it's quite a change for National Grid. It was something very different to what we would have done in the past but it's absolutely the right thing to do for all parties." 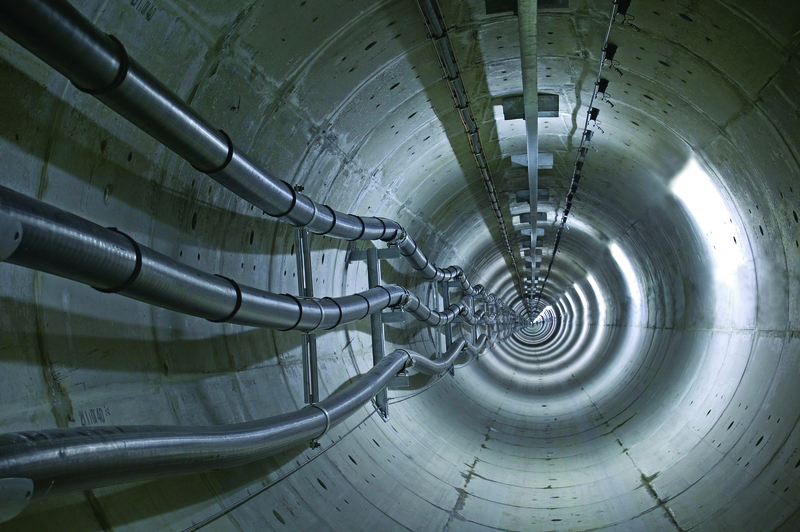 London cable tunnels: National Grid owns and operates four of the eight regional gas distribution networks in the UK.